As the holidays near you might be wondering what you can contribute. One thing is certain, though, and that’s that there can never be too many desserts. Insert this Keto Pumpkin Pie. This traditional holiday pie is one that shouldn’t be left out. This smooth, silky, rich, and decadent dessert is the perfect end to any meal, whether it’s around the holiday season or not. You don’t have to make up an excuse just to make this pie, just do it. 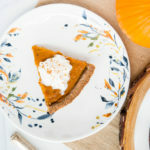 This Keto Pumpkin Pie is loaded with a dose of healthy fats that will definitely keep you satiated and in ketosis. It will boost your energy levels, help regulate your cholesterol, and help keep your heart strong and healthy. Like, who wouldn’t want a piece of this pie? The fall pumpkin craze isn’t one you should turn away from. In fact, you should just embrace it. Pumpkins contain beta-carotene and beta-cryptoxanthin, and alpha-carotene, which are types of antioxidants that can neutralize free-radicals, which prevents cell damage. Doing this reduces oxidative stress within the body, which in turn lowers your chances of chronic illnesses including heart disease [*][*]. Eggs are a powerhouse. They contain a complete amino acid profile and are loaded with protein. They also contain omega-3 fatty acids, which are incredibly good for your heart and have been shown to aid in the reduction of cholesterol, significantly reducing your risk of heart disease and stroke [*]. On top of that, eggs contain lutein and zeaxanthin, which is great for heart health and the prevention of cardiovascular disease [*]. Almond flour plays a key role in heart health, as well. It’s rich in vitamin E, which is a fat-soluble compound that help prevent damage caused by free radicals, which in turn reduces your risk for diseases like cardiovascular [*][*][*]. Many times after consuming dessert you’ll soon find yourself in a food coma. We’ve all been there… extremely full, bloated, and sluggish. Not this with dessert. It does the exact opposite. That’s right, it boosts your energy levels. The MCTs (or medium-chain triglycerides) in our Perfect Keto MCT Powder Vanilla make ketones readily available for the body to use instead of getting stored as fat. If you’re already in a state of ketosis, this will keep you there; however, If you’re not, then it helps you achieve it sooner rather than later, all while maintaining healthy energy levels. The lutein found in eggs isn’t just beneficial for reducing the risk of cardiovascular disease but also for boosting energy and physical activity. Studies have shown that by eating foods rich in lutein enhances physical performance [*]. Almond Flour is great for boosting your energy because contains a dose of vitamin b2 (riboflavin) which helps keep those levels stabilized [*]. Not only does almond flour keep your energy levels stabilized, it also helps regulate cholesterol by lowering LDL (or low-density lipoprotein), aka bad cholesterol, and regulating HDL (or high-density lipoprotein). Isn’t that nuts? We keep mentioning the lutein found in eggs but it’s just so full of health benefits that we can’t keep it to ourselves. Lutein helps regulate HDLs (high density lipoproteins, aka good cholesterol) and LDLs (low density lipoproteins, aka bad cholesterol). By doing this, it lowers inflammation in the bloodstream and loops back up to our #1 health benefit of maintaining heart health [*]. If you take anything away from this, just know this low carb pie will completely rock your world and you’re going to need to make a couple to save face so that your Aunt Martha doesn’t get upset that she didn’t get a piece at Christmas. You’re welcome. Combine all the dry ingredients for the crust in one bowl and the wet ingredients in another bowl. Gently add the wet ingredients to the dry ingredients and mix until well-incorporated. Press the mixture into a pie plate, evenly, allowing the mixture to sneak up the sides of the dish and start to take shape of a pie crust. Set aside. Combine all the dry ingredients for the filling in one bowl and the wet ingredients in another bowl. Gently add the wet ingredients to the dry ingredients and mix until well-combined. Pour the mixture into the prepared pie plate and spread evenly. Bake for 30-35 minutes. Can be served warm, at room temperature, or refrigerated until ready to be eaten. Top with homemade whipped cream (using heavy whipping cream) or whipped coconut cream!